Services offered in https://unifiedportal-mem.epfindia.gov.in i.e How to update your KYC details online, EPFO online services, PF withdrawals, UAN Activation, PF Transfer etc…. The Employees Provident Fund Organization (EPFO) came up with simple ways of getting closer to the members and ensuring their members reach them as fast as possible. The best and the easiest way they made this possible was by opening an online portal where members would get most of the services at the comfort of their house. The portal they first created was however limited and provided just a few services. This pushed the organization to come up with better ways of reducing traffic on this single portal as well as availing many more services that were initially not available online. This is what led to the birth of several other websites apart from the initial single portal. 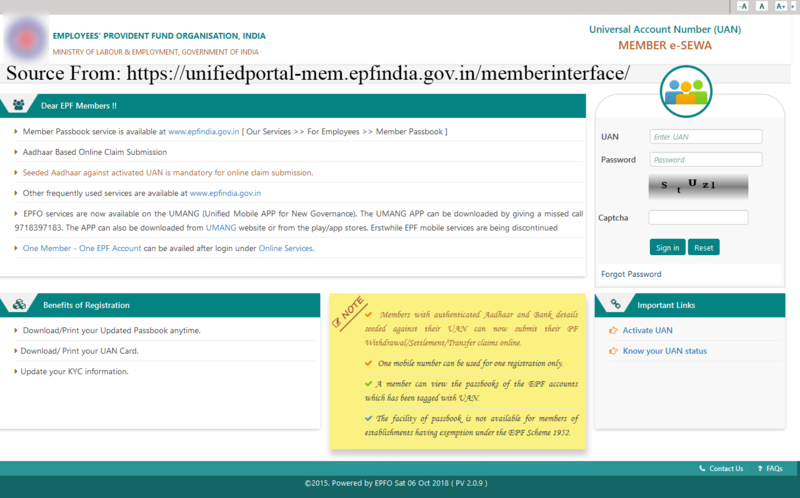 One of the websites created to serve this service was the http://unifiedportal-mem.epfindia.gov.in/memberinterface/. In case the employee wants to make some withdrawal from their PF account, they will not need to interact with their employer. For that reason, one doesn’t need to keep visiting their ex-company for an authorized person’s signature. Although this might seems to like an extra task, it is a very important and special point since, you cannot get your KYC details seeded until they Activate UAN. Activating your UAN on the other hand comes with great benefits one of the most important being; a member can be able to access their PF Passbook hence able to keep track of their monthly contributions. Once you seed your KYC details successfully via the PF portal, you will subsequently receive approval from your employer which will save you from cumbersome part of the EPF. Once you have your KYC details successfully seeded, you will be able to easily transfer your EPF account from one account to another in case you switch employers. It is however important to have your; Bank account number, PAN Card number, IFSC Code, and Aadhaar Card number ready before starting the seeding process. Activating your UAN: To activate your UAN, visit the official EPFO portal and follow the procedure given. The second step is filling up the necessary details: It is important to note that filling up all the blank spaces is a mandatory requirement. This is followed by filling up the Captcha provided then clicking the “Get Authorization Pin” icon. Key-in the OTP sent to your mobile phone number: For you to correctly enter the OTP, click the “I agree” button. Once this is done, your UAN will be activated. The next step will be clicking on the KYC menu. Fill in all the necessary details and click the ‘save’ option once you are through. Once everything is correctly done, another screen opens up showing ‘Pending KYC’. Once your employer approves your uploaded KYC, the ‘Pending KYC’ status will change to ‘approved KYC’. Once this is done, it will automatically reflect on your employer’s EPF portal immediately you click the ‘Save’ button. Login to the site: The first step is always logging in to the Member Interface of Unified Portal using your UAN and password. The site is https://unifiedportal-mem.epfindia.gov.in/memberinterface/ . Accessing the site: Once you’ve logged-in, the next step is selecting the “Manage>Modify Basic Details”. Provide the necessary details: These details should be exactly as they appear on the Aadhaar as the system will verify them using UIDAI- Aadhaar Data. Click update details: Once you click “Update Details” icon, the request will be submitted to your employer for further approval. Employer logins in: The employer will however not login through the same interface but through their Employer Interface of Unified Portal which is: https://unifiedportal-emp.epfindia.gpv.in/epfo/. Employer accesses the change requests: Once the employer logins in using the above link, he/she will then clock on “Member>Details Change Request” to be able to view the change requests made by the employee. Employer’s Remark: Once the employer goes through the proposed changes, he/she takes the appropriate action which is giving the proper remark. Moves to the EPFO office: Once the employee and the employer have done their part, the request now appears as a task in the ‘Login of Dealing Hand’, of the concerned EPFO office. Dealing hand logins in: Dealing Hand will login in but will use a different interface from the employer and the employee as he logins through ‘Field Office Interface of the Unified Portal’. Submission to the Supervisor: Once the request has been verified, Dealing Hand will then submit his/her recommendation to the Section Supervisor. The request is either approved or rejected: The Dealing Assistant is responsible in putting the submitted request for either approval or rejection. He/she does this by selecting the proper radio button. That is; “Recommended for Approval”/ “Recommended for Rejection”. However, he/she must add proper remarks to support their decision. Submission to the APFC/RPFC: This submission can be done by either the Dealing Assistant or the Section Supervisor. The case is either rejected or approved: Once the APFC/RPFC receives the case, they can choose to either approve or reject it.